I always had my friends over after school. There was a trail of kids walking threw the front door. Looking for goodies. They knew mom was always baking something. And the kitchen was always smelling good. Mix all dry ingredients in a mixing bowl. Add egg, oil and vanilla. Stir well. 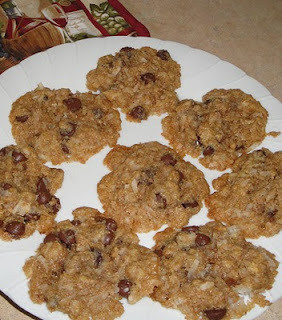 Drop by teaspoon on greased cookie sheet. Bake at 325 degrees for 8 to 10 minutes. Cool before removing from pan. Enjoy! Love coconut and chocolate...unique recipe since it uses oil instead of butter. These look great! I still love having an after school snack, I'm always starving by the end of the day. Hi Bo, I also love coconut and chocolate. I like the mounds candy bar, I just wish the mounds candy bar was bigger. Hi Christina, I still like the after school snack, or should I say after work snack... lol. I sometimes eat dessert before dinner. i love chocolate, i love coconut, and i LOVE cookies, what more could i ask for? sounds and looks absolutely scrumptious! Thanks for the easy to fallow direction! Oh yum, crispy chewy cookies with coconut? Yes please! Oh, I'm going to see our Chocolate Coconut Acolyte this evening. I'll mention your recipe to her. Hi The chocolate Priestess, I was just looking at your blog. Love it! I'm following your blog, and invite you to do the same. I'm also on Facebook. Thank you for stopping by. Looking forward to sharing! Oh yes, all that yumminess in one cookie. I'd have been following you home after school too if I had lived near you. Thanks for stopping by my blog and giving me the chance to find yours. Lovely cookies! I love anything with coconut and chocolate. More like I AM like your kids. =) I always need a snack, especially if they are like this! This looks good. It is unusual for a cookie to call for oil but I like it. I don't use butter often. Hey everyone, I wanted to take a moment and say thank you to each and everyone of you. I love to hear from you. Amazing.. I can taste it now..
now i know how to tackle all the coconut i've been hoarding in my pantry! thanks for sharing.